Oceania Cruises has long been committed to providing superb cuisine at sea, from the not-so-humble burger (the Kobe beef version at Waves Grill is a standout) to miso-infused sea bass at Red Ginger, its Asian fusion restaurant. On Sirena, Oceania has modified restaurant options to include more choices (when compared to the line's other ships of the same size), adding Red Ginger (a standout on the fleet's larger Marina and Riviera), combining the Polo Grill steakhouse and Mediterranean-influenced Toscana into one restaurant called Tuscan Steakhouse, and adding the all-new lunch-only Jacques Bistro, which takes over the Grand Dining Room every day save for embarkation day. Refreshingly, Oceania levies no service charges at any of its restaurants, though venues like Tuscan Steak and Red Ginger do require advance reservations. 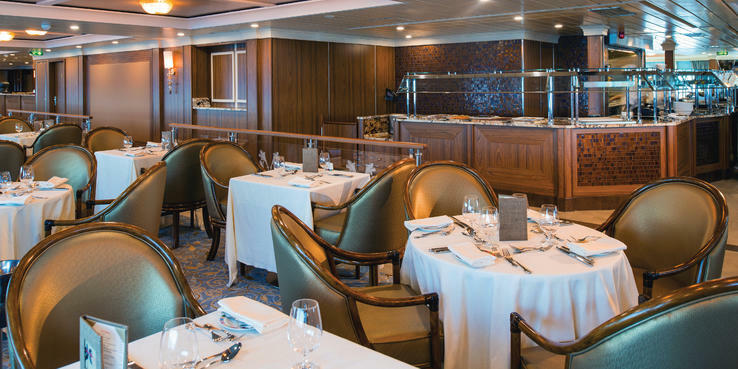 The Grand Dining Room (Deck 5): The Grand, Sirena's main dining room, is one of the nicest in cruising, with comfortable seating and plenty of tables for two or more. It's surrounded on three sides by windows. The Grand is open for breakfast and dinner. (At lunch, it transitions into Jacques' Bistro.) It's an open-seating restaurant. At breakfast, the vast menu includes everything from granola to lamb chops (and quite a bit in between, such as eggs Benedict, steamed haddock, grilled steak, omelets and waffles). We love the "express breakfast" option aimed at those in a hurry, as well as the selection of Canyon Ranch SpaClub lighter-fare dishes; try the frittata with bell peppers. There's a smoothie and juice menu. The fact that orange juice is not freshly squeezed on a ship with such a high level of cuisine is a head-scratcher. Breakfast is served daily from 7:30 to 9:30 a.m. If you can't find something that tempts on the Grand Dining Room's dinner menu, you're not looking hard enough. The menu offers terrific options. Starting off there's the Canyon Ranch "healthy living choices" menu, with options like a blue crab cocktail, yogurt, dill and cucumber salad and herb-crusted rack of lamb with ratatouille. Calorie, fat and fiber gram statistics are provided for each dish. A dessert option is always available. The restaurant's four-course degustation menu offers course-by-course wine pairing; the menu items are also available on the evening's regular offerings. On our cruise, one night's experience included an Emmental and leek quiche, a farro salad, coq au vin over freshly made pasta and a choux pastry with cream. The degustation menu is offered every night in the Grand Dining Room. There is no charge for the cuisine but there is a per-glass charge for each of the paired wines. The Grand's main menu includes appetizers, salads, soups, entrees and dessert, a nice balance between meat, seafood and vegetarian options. It changes nightly, and at least a handful of dishes will reflect the region in which Sirena is cruising. We love the incorporation of Jacques Pepin's classic dishes -- steak frites, rotisserie chicken and poached salmon -- all available every night. Also on the "always" list are steamed vegetables, baked potato, Franck's fantastic mashed potatoes (a family recipe of Oceania corporate chef Franck Garanger) and pasta. Dinner is served nightly from 6:30 to 9:30 p.m.
Jacques' Bistro (Deck 5): To offer another dining option on a small ship, and to work in more dishes from culinary director Jacques Pepin, Oceania got creative and introduced Jacques' Bistro on Sirena. Instead of a standalone venue, the bistro is a reconfigured lunch option in the Grand Dining Room, with menus offering casual French fare. The comprehensive menu offers so many choices, from a simple croque monsieur (the French interpretation of a grilled ham and cheese sandwich) and the most delicious escargot to elegant fare, such as lemon sole and roast chicken with pumpkin gratin. The menu changes daily, and there are 14 iterations. A specials list every day includes a burger (one day it was a Bombay turkey burger with garlic-curry sauce), along with more traditional French fare, such as veal stew. Desserts, including a decadent strawberries Romanoff (and sugar-free ice creams as well) were superb. We loved the ambience, with French torch songs playing softly in the background, though would encourage Jacques' Bistro to create its own wine list with a better representation of French bottles. Reservations are not necessary. Jacques' Bistro is open from noon to 1:30 p.m. daily. Terrace Cafe (Deck 9): The Terrace Cafe, the ship's buffet venue, offers both cooked-to-order stations and already prepared fare at breakfast, lunch and dinner. It's a lovely space, wrapping around three sides of the ship's aft, and its outdoor deck has tables for dining in good weather. It's one of the nicest places onboard to sup. At breakfast, there is an extensive selection of fruit, pastries and cereals, and egg dishes are cooked to order. French toast and pancakes, and breakfast meats and cheeses are available as well. At lunch, there are hot and cold options, including a pasta of the day and a carvery, along with hot side dishes like mashed potatoes, vegetables and rice. Also plentiful are salads, ready-made sandwiches and desserts (the ice cream's a big hit). Don't miss the sushi bar. For dinner, the Terrace Cafe largely mirrors the menu offered in the more formal Grand Dining Room with the caveat that the ambience is much more casual. There's a lovely cheese cart, more fresh sushi and, once again, the bountiful dessert display. Waves Grill (Deck 9): Waves Grill, tucked between the Terrace Cafe and the swimming pool, is an Oceania signature. Burgers -- including beef, turkey and tuna -- along with grilled panini, Reuben sandwiches and delicious skinny fries are superbly prepared. You can find healthy options, too, like grilled chicken and mahi-mahi sandwiches and gravlax. The small salad bar is, unfortunately, not particularly appealing. If you want some greens, we recommend requesting your grilled items to be delivered in the Terrace Cafe, which has more fresh options for salads. Waves Grill also has a fabulous milkshake and smoothie bar, and serves up housemade ice creams. Waves Grill is open from 11:30 a.m. to 4 p.m.
Tuscan Steak (Deck 10): This new blend of Oceania's trademark Toscana (Mediterranean) and Polo Grill (steak) restaurants offers a balance of tried-and-true favorites from each -- along with some new twists. Fans of Oceania's Toscana might want to know that there's no olive oil bar at Tuscan Steak, but each night a different variety is featured so you can try a few. Popular dishes include starters like pork belly, lobster bisque and Chesapeake Bay crabcake. The grilled Romanesco salad, with asparagus, is delightful, and you can never go wrong with Oceania's Classic Caesar. For entrees, there's a meat selection that includes Kobe meatballs, osso buco and lamb chops -- all pretty predictable choices for the steakhouse aspect of Tuscan Steak. For seafood lovers, lobster fra diavolo was a huge hit on our trip, as was the more simply prepared lobster with butter and the Dover sole. Pasta gets good representation, too; you can order an appetizer or entree portion, depending on your appetite. Choose between a wonderfully simple and fresh capellini with mozzarella, hand-rolled potato gnocchi or lobster risotto. Tuscan Steak is open from 6:30 to 9 p.m. every night. Reservations are required. Red Ginger (Deck 10): Originally rolled out on Marina, Red Ginger was an instant hit, with its Asian-fusion cuisine and dramatic and sleek setting. Oceania's R-class ships were only able to feature a few of Red Ginger's items on the Grand's menus because the smaller ships did not have space for an additional restaurant. Sirena is the first in the class to get its own Red Ginger, and fans of the restaurant will be relieved to find that there aren't too many differences. The menus are occasionally tweaked, but classics like the miso-glazed sea bass, lobster pad Thai and the scrumptious seven spices-crusted lamb rack are all here. One big difference is the ambience; Red Ginger's signature red and black decor is consistent, but unlike the Marina and Riviera versions, Sirena's restaurant has walls of windows along two sides for magnificent views. Reservations are required. Red Ginger is open from 6:30 to 9 p.m. nightly. Afternoon Tea (Deck 10): Each afternoon, tea (and delectable pastries and savory sandwiches) is served in the Horizons lounge. Tables are dressed up with linens and a quartet plays classical music. Afternoon tea is offered from 4 to 5 p.m.
Room Service: Complimentary room service is available 24/7 to passengers in all cabin categories. At breakfast, cooked and continental options are on offer. The anytime menu is quite comprehensive, offering everything from club sandwiches to salads (Cobb or Caesar), burgers (turkey, veggie, Black Angus) and grilled chicken and steak. Dessert is also available; if you are calorie splurging we recommend the warm apple pie with toffee sauce. Course-by-course service during all restaurant opening hours is available to passengers booked in suite cabins.